Claus: The idea of ANOXIA was created in Nyborg, Denmark in 1996. 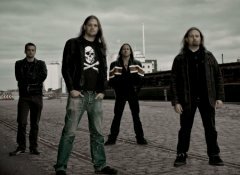 After a couple of demos and lineup-changes the band recorded the promo “Kept In Sin” in 2005, which was warmly received in the press and spun off several concerts. The line-up and sound of AnoxiA has been stable since 2004. Calle: Why did you choose the name AnoxiA for the band? Claus: It sounds metal and gives some good graphic opportunities with an "A" in each end of the word. Claus: I have always been a fan of music myself, and back in elementary school I was indeed amazed by the awesome sounds that came out of many guitar players back then in the late 80es. The path to become a guitarist myself was obvious. Claus: In the band there is a lot of music that we worship and adore, and that way around becomes inspirational. A lot of different music, but every member of the band loves AC/DC, Iron Maiden, DIO and Slayer, just to name a few. Calle: How would you describe your music to people who haven’t heard AnoxiA yet? Claus: The style is thrashy heavy metal, based on the old school but added modern elements as well as rock ‘n’ roll. Melodic, clean, yet raspy vocals on top of it all. "A Lapdance For The Devil"
Calle: You’ll release your debut album “A Lap dance For the Devil” in February 2010. What can people expect from the album? Claus: The album contains 10 tracks, all bearing a different sound than you will usually hear. The album is for lovers of heavy metal who also like a thrashy and aggressive twist. The good melody is a main ingredient in all of the songs. Other spices include the twinkle and the rock ‘n’ roll attitude. Plus that, when you purchase the CD you will get an awesome cover-artwork created by the very talented artist Mr. Alen Domazet. Claus: The AnoxiA writing process is, that usually someone brings a riff or an idea for a drum pattern into the rehearsal room. From there it is a collective process, where we jam on the bit, discuss which overall feeling and sound that we want the new song to have. More parts are created, and eventually a rough track is born! The lyrics are written after the song is finished, when the mood of the song is fixed. That way all the tracks on the new album came about. Recording-wise we recorded the drums in Jailhouse Studios with Tommy Hansen, took the session back to Muzirkus Studios where we recorded guitars, bass and vocals, then once again brought the session back to Jailhouse for mixing and mastering. Calle: You worked with the legendary Tommy Hansen on the new album. How did you get in touch with him? Claus: We worked with him before on our 2005-promo "Kept In Sin", on which he also did the mixing and mastering. Back then we researched a number of producers and their works, and decided that the sound and production that Tommy Hansen was able to deliver would be perfect for our music. It was, and that's why he was hired once again. Claus: This is the question where you would normally reply "All of them!". But to highlight a few, some of the strongest ones are "Lapdance for the Devil", "Risky on the Rocks" and "Hell bent for Heaven". And in the slightly mellow alley I must mention "Lonely Ride". Calle: You have opened for bands like W.A.S.P and Krokus. What other band would you like to open for/play with? Claus: Gigs are currently being booked for our 2010-tour, and in fact we are most likely to be opening-act for Artillery on a number of dates on their tour this year. 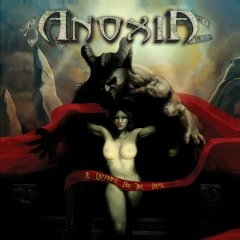 Calle: What can people expect when they go see AnoxiA live? Claus: A relentless musical energy-release!! We put a lot of effort into the show and the contact to the audience. A metal show with a strong rock n roll attitude where you can see the guys in the band really givin’ it 110%! 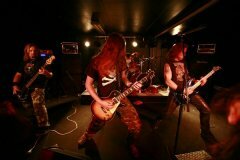 Claus: All members are dedicated, funny and METAL! Calle: How do you see the Danish rock/metal scene right now? Claus: The scene is very strong at the moment and has some good attention. Not least thanks to Volbeat, like it or not. A lot of good bands are around at the moment. Calle: Do you have any plans on a tour in Denmark or Europe in the near future? Claus: The first leg of the “A Lapdance for the Devil”-tour will be haunting Denmark during this upcoming spring. Europe will hopefully come after that! Dates will be announced on Myspace and Facebook. Calle: Where do you see AnoxiA in 10 years? Claus: A couple of albums richer, and hopefully on top of the world too! Claus: That was a cassette of the first Gorky Park-album. Quickly that was worn out, so I went on to purchase my first LP which was the mighty eye-opener: AC/DC’s The Razors Edge. Claus: Status Quo around 1988. My dad brought me there, and my friend and I were lifted beyond the security-rail where we attended the show in amazement. Calle: Who’s the last band you’ve seen in concert? Claus: Winger!! Awesome show at The Rock; <?xml:namespace prefix = st1 ns = "urn:schemas-microsoft-com:office:smarttags" />Copenhagen. Claus: “Enter Sandman”. Not because it’s my favorite song or anything, but it would for sure have been the key to instant fame and fortune. Claus: Complain all the time! Claus: Check out our music on myspace.com/anoxiadk, get hooked, buy the album, come to our shows and go NUTS! !